This beach hotel consists of 416 rooms and a wonderful, large garden. Amongst the hotel facilities count a foyer with 24-hour reception, a currency exchange desk and a lift. In addition, there is a café, a bar, a games room and an air-conditioned restaurant with children''s highchairs. Business guests are offered several public Internet terminals as well as 3 conference rooms and there is a kids club as well as a playground for younger guests. In the Gran Camp de Mar Hotel we write sports in capital letters. With our exclusive location, facilities and an experienced team, you can practice some of your favorite sports while you are on vacation. The animation team offers you many other activities. The hotel has facilities for fix and storage of bicycles. Note: space is limited, depending on availability, integrated into the entertainment weekly. Water activities are carried out according to weather conditions and where the sea conditions permitting. We offer daytime entertainment for children from age 4 onwards. Several times a week, crafts, games and other (children play ground and play room in the Hotel). In the evening children can enjoy the mini disco. Babysitting up on availability (with charge). 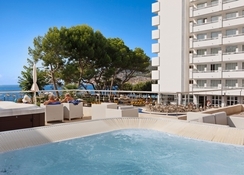 We can manage your golf reservations in the fields of Andratx, Santa Ponsa and Bendinat. 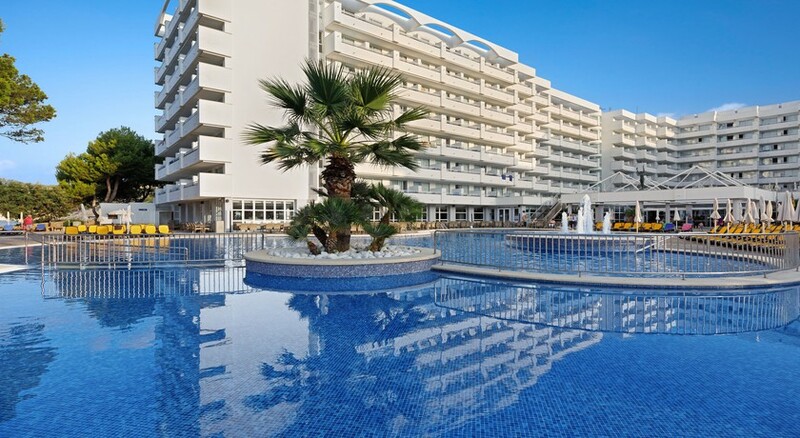 The restaurant has a splendid buffet with great a variety of food and offerings for both guests who wish to follow a special diet as well as those who want to enjoy a great variety of Mediterranean and international dishes. Twice a week, we offer themed buffets. The breakfast buffet, offering a wide variety of pastries, cold cuts, cereals, fruits and much more that will make the breakfast a great banquet. Twice a week, breakfasts are served with sparkling wine. In the show cooking and under the watchful eye of our customers, cooks prepare pastas, meat and fish. In summer the restaurant opens its doors to a terrace overlooking the sea, where you can taste our gastronomy enjoying the sea breeze. It will be a pleasure to offer you here the opportunity to enjoy a hot or cold snack while you relax on our terraces or swimming-pool. Do not end the day without visiting our Lounge Bar and spend a pleasant evening. We offer you a variety of alcoholic and non alcoholic beverages or the finest cocktails. Our entertainment team, will surprise you, a few times a week with shows, live music or dance music. For going out to nightclubs or other alternatives, please contact the entertainment team or the reception desk. Rooms are comfortable and modern, offering all the comforts of a 4 star hotel. 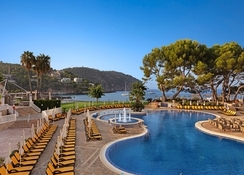 Most of the rooms at the Gran Camp de Mar Hotel enjoy an excellent front or side sea view. Contemporary design, all rooms have a terrace or balcony as well as air conditioning and central heating, plasma-TV with international channels (satellite TV with radio channels), telephone, safe (with charge), refrigerator and a bathroom with makeup mirror, hair dryer and small personal care products. The Hotel is also well suited to the needs of families and offers double rooms with connecting door.If needed, we offer dry cleaning services (fee). For the most demanding guests, our suites offer the best views to the Mediterranean and the finest decoration. The rooms have all the comforts of the doubles, but are distinguished by their living, a second bathroom and a large terrace. The Hotel complex is located just minutes from the sandy beach. Public transport connections are situated just 300 m away, allowing easy access into Paguera. There are a profusion of wonderful bars, restaurants, nightclubs and shopping facilities to be found in Paguera. Loved every minuet! Would defiantly go back again! Really enjoyed spending my birthday there!